Sign up today and receive a weekly update! Find us on PA AgMap. Posted 5/4/2011 8:00pm by Miranda Combs. Of course we will have a nice variety of our regular selections available. Remember to call by Thursday evening! The number at the farm is 724-898-2316. Also, please remember that order pick-up time is from 5am-10:30 am . We will try our best to hold the orders if you run into problems and are running late... BUT...please call the stand # (412-661-1875) so that we KNOW you are running late !! Thanks and see you Saturday!! Please visit the market's website for information on the market and all the vendors. You can sign up for a weekly email update. 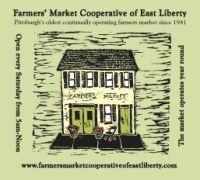 The Farmers' Market Cooperative of East Liberty is located at 344 North Sheridan Ave., adjacent to the Home Depot parking lot. The market operates year round- and is open from 5 AM until 12 noon every Saturday of the year. All content property of Farmers' Market Coop of East Liberty. 344 North Sheridan Avenue,Pittsburgh, PA 15206. Contact Us.